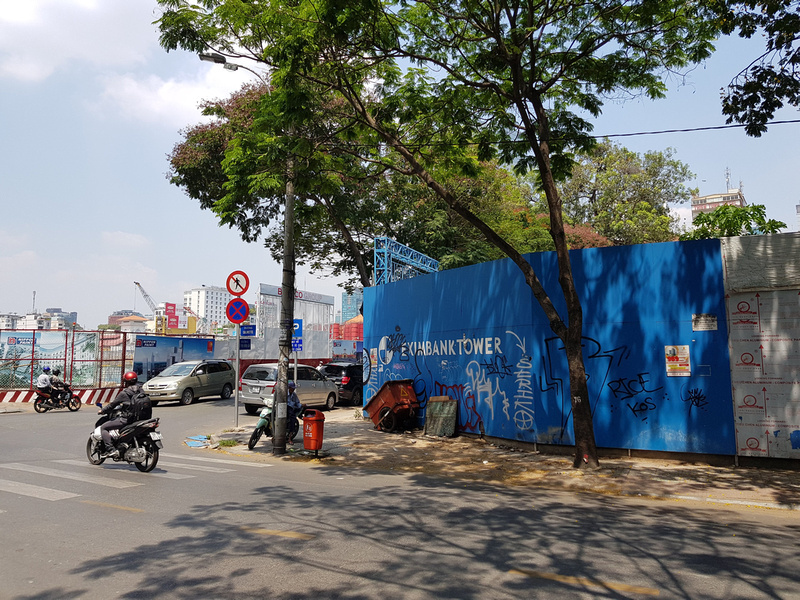 While there has been a building boom that is transforming Saigon, there is also a large collection of stalled and abandoned construction projects. These projects range from stalling at the starting gate, to being almost finished and then abandoned for various reasons. 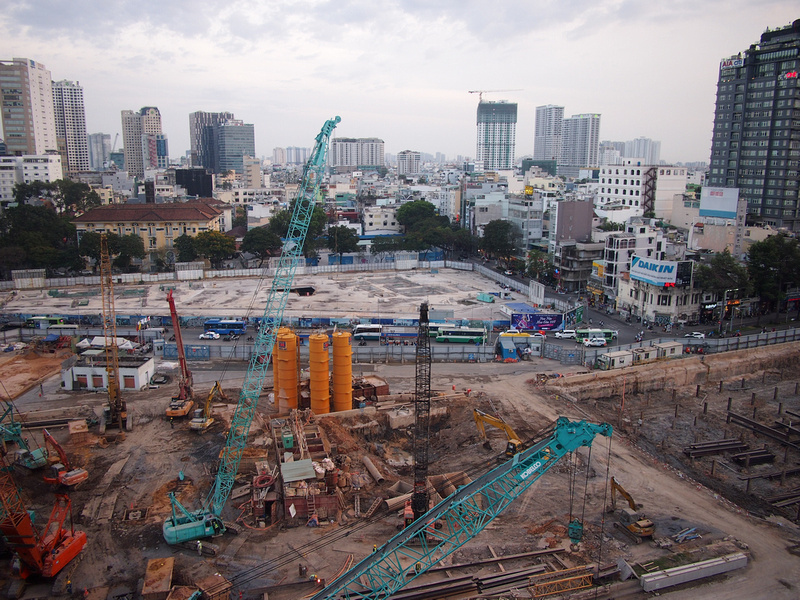 This is a look at some of the most prominent unfinished structures in Saigon. I’ll be continually editing this page, so if you find another one let me know, and hopefully I will be able to move some of these projects back into the under construction page. Location: 1 Pham Ngu Lao, District 1. 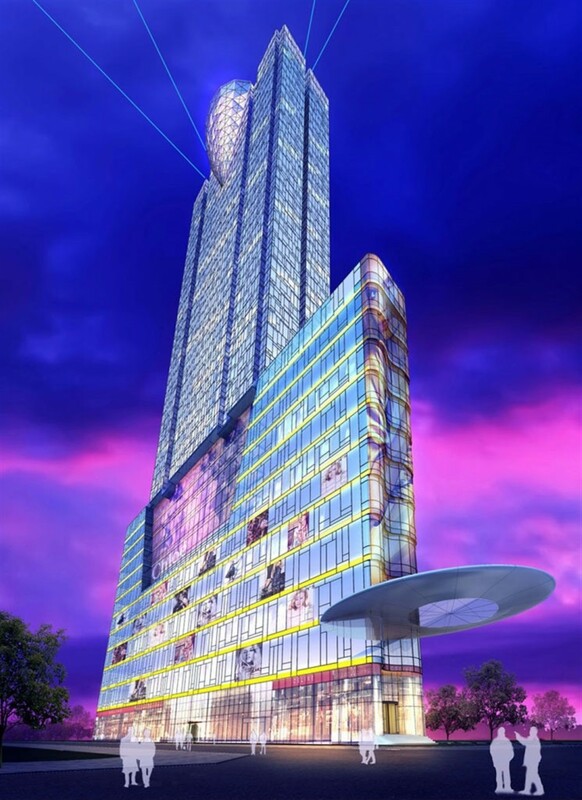 The Spirit Of Saigon (previously known as The One Ho Chi Minh City) will be two towers connected by a podium. 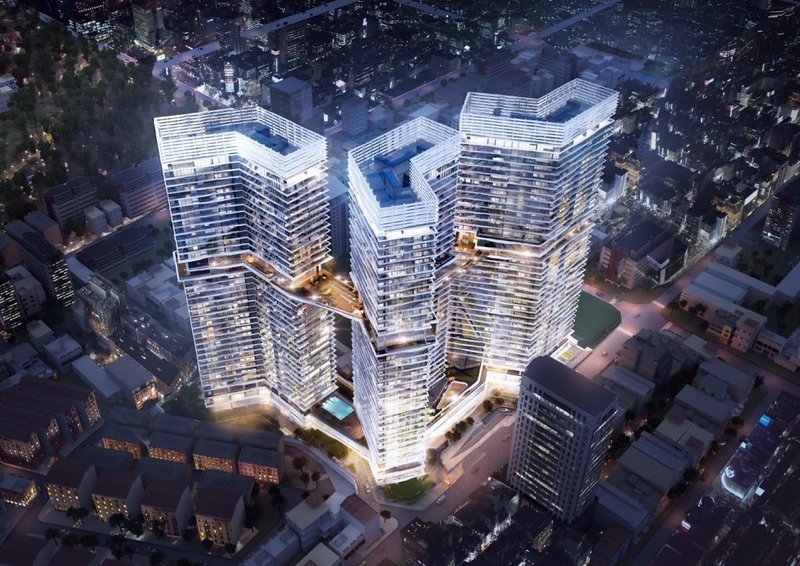 The 55 and 48-storey towers will contain a mix of office space, residential apartments, and a hotel. Originally the Ritz Carlton was going to be the hotel, but they have since pulled out. 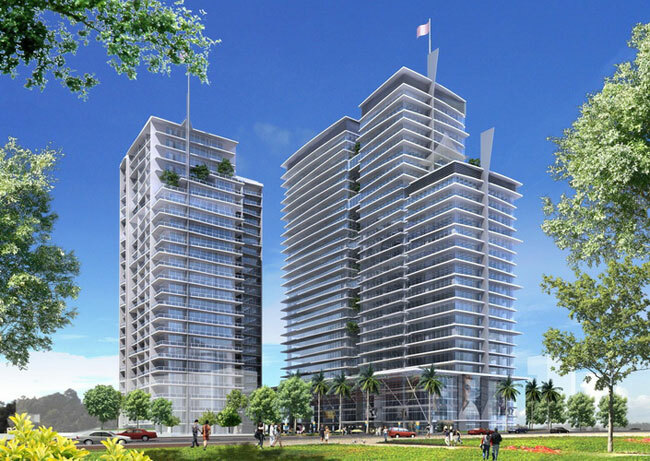 The towers represent two dragons with pearls in the mouths (a nod to Saigon when it was the ‘Pearl of the Orient’). After years of delays, work actually got started on this. There were three cranes on the site and a hive of activity building the basement levels. Once the ground floor was poured, work stopped and the equipment was removed in mid-2017. 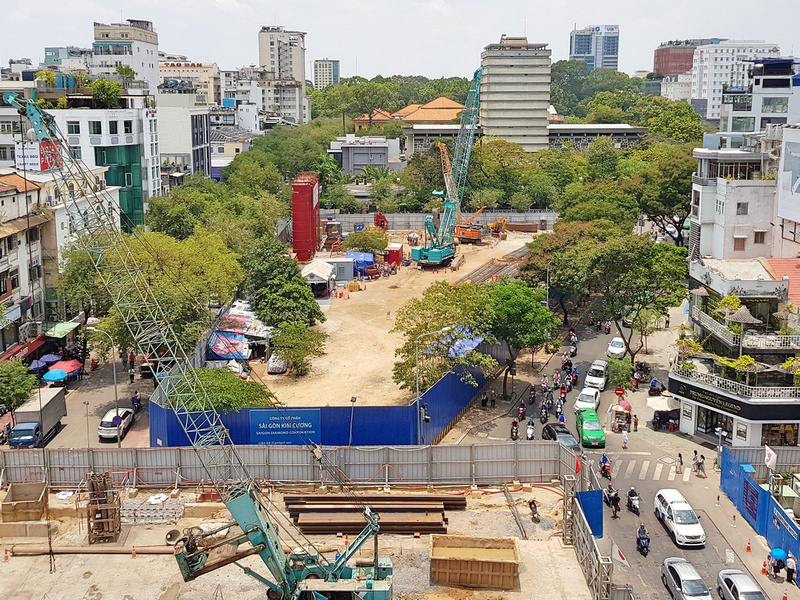 The most prime piece of real estate in Saigon is currently laying idle next to the Ben Thanh Central Station construction site. 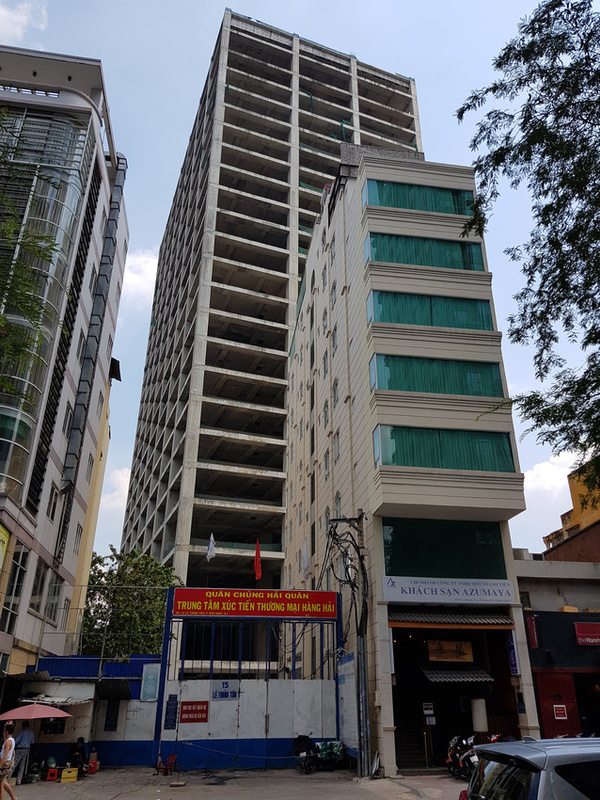 Location: 34 Ton Duc Thang, District 1. 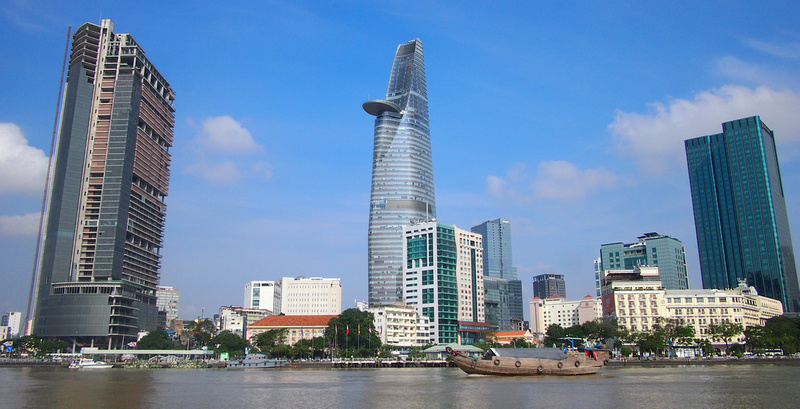 Perhaps the most infamous abandoned project is Saigon One; the Ghost Tower of Saigon. Work began on the site in 2007, and by 2012 it had topped out and half of the windows were added. Then the project was abandoned. 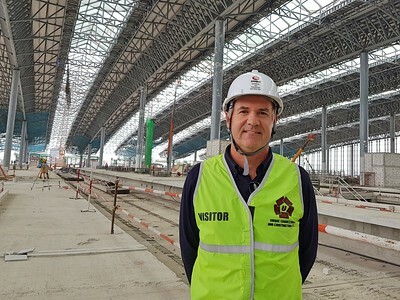 Since then rumours have circulated about its fate, and news stories emerge every year announcing that construction will recommence. In 2017 it was reported that the property was seized from the developers and will be auctioned off. 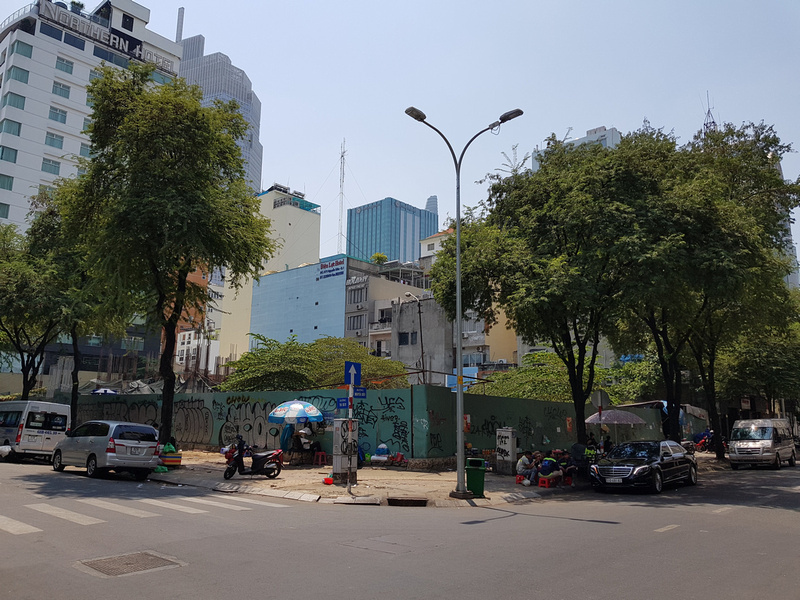 Location: Corner of Le Loi and Nguyen Hue, District 1, HCMC. 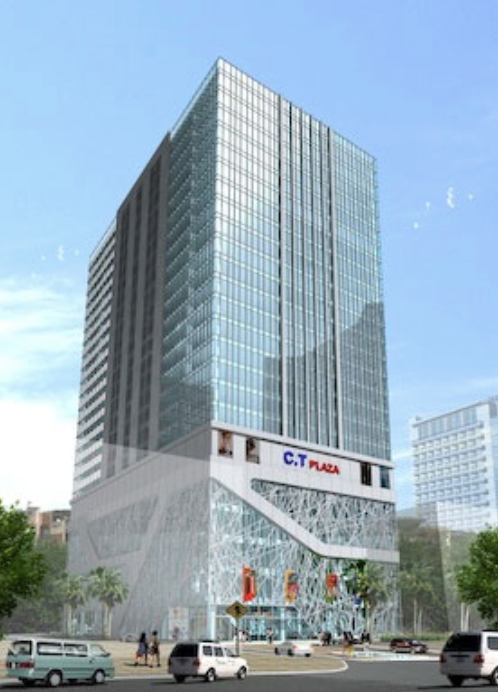 The Satra Tax Plaza is on the prominent corner of Le Loi and Nguyen Hue on the site of the former Saigon Tax Trade Centre. It’s not known if the mosaics from the previous building will be included. 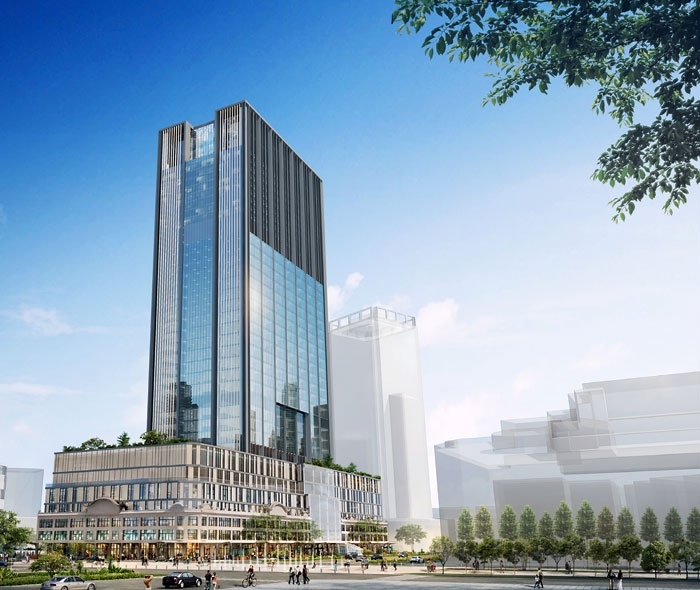 The new tower will include The Okura Prestige Saigon; a 5-star Japanese hotel. 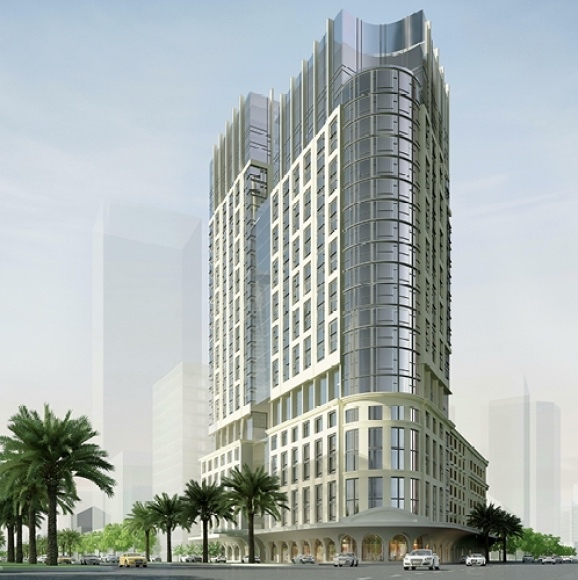 The hotel was scheduled to open in 2020, but work stopped in April, 2018 and the site was cleared of all construction material. 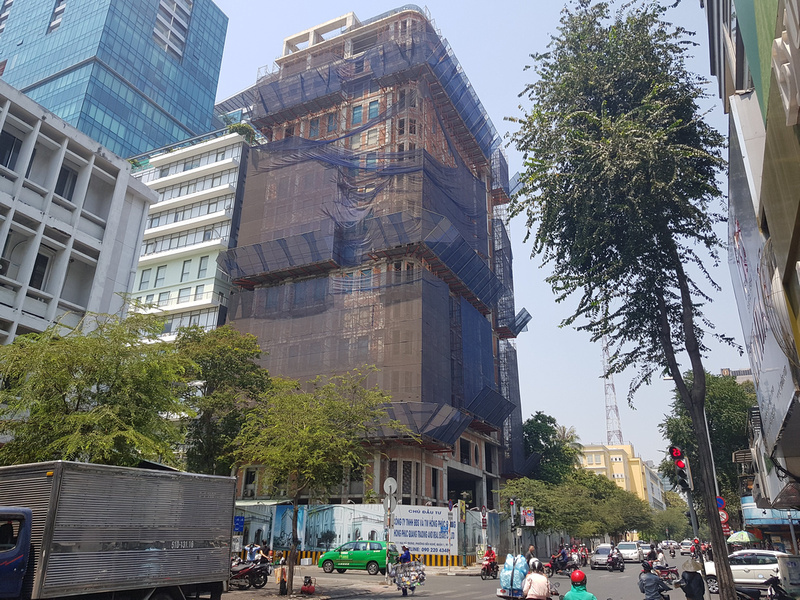 Work on the Saigon Jewelry Center (SJC) briefly began in December 2016 only to stop again shortly thereafter. Work recommenced in March, 2018 and was abandoned once again. Here is a concept video of what the completed project may look like. 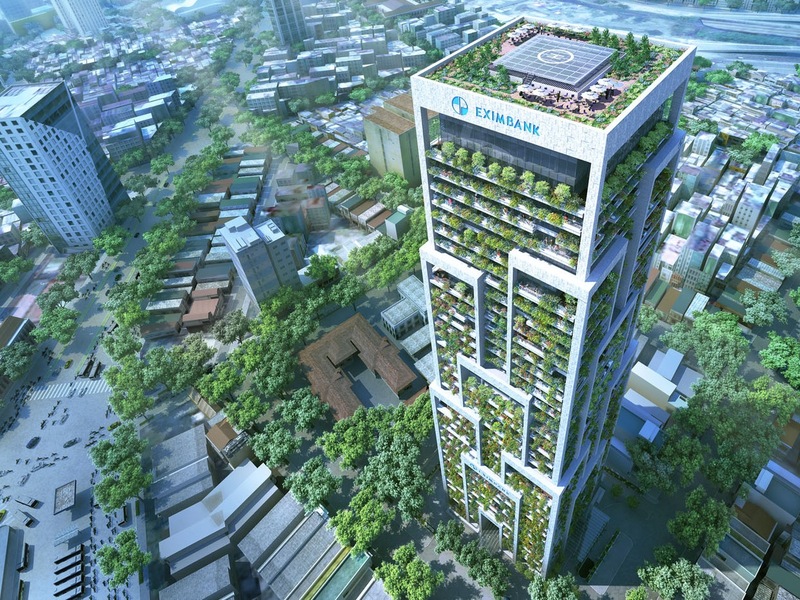 The Eximbank Tower near Ben Thanh market was announced in 2012. The block of land was cleared, but it has since only served as a parking space. Location: 12 Le Duan, District 1, HCMC. 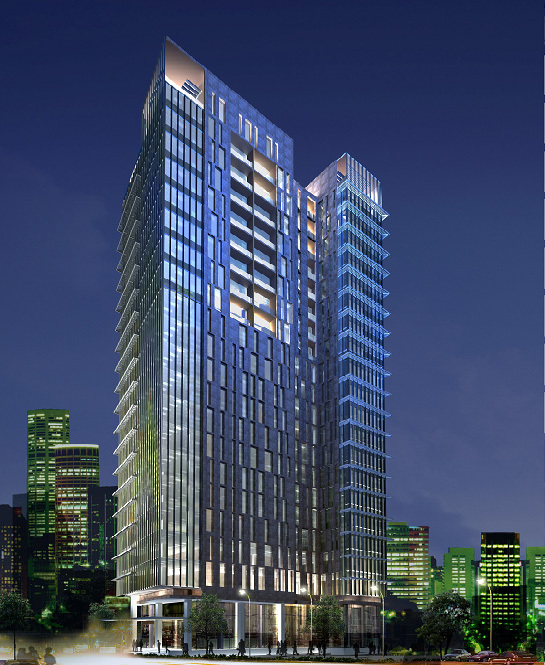 Lavenue Crown is a proposed mixed use tower featuring a retail space at the podium level, a five-star hotel, and executive residential units. 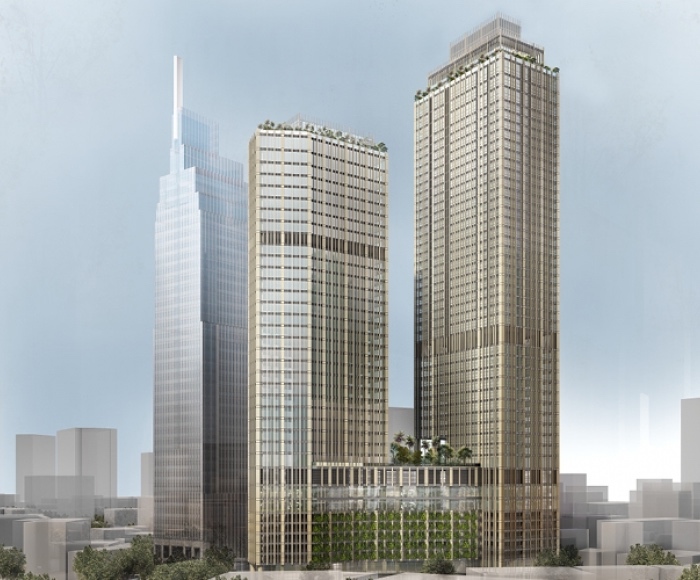 The land is opposite the French consulate on the former site of the Hotel du Controle financier building. The original heritage building was falsely classified as being faux-colonial, thus it was given the go ahead for demolition in 2010. Location: 2-4-6 Hai Ba Trung, District 1, HCMC. 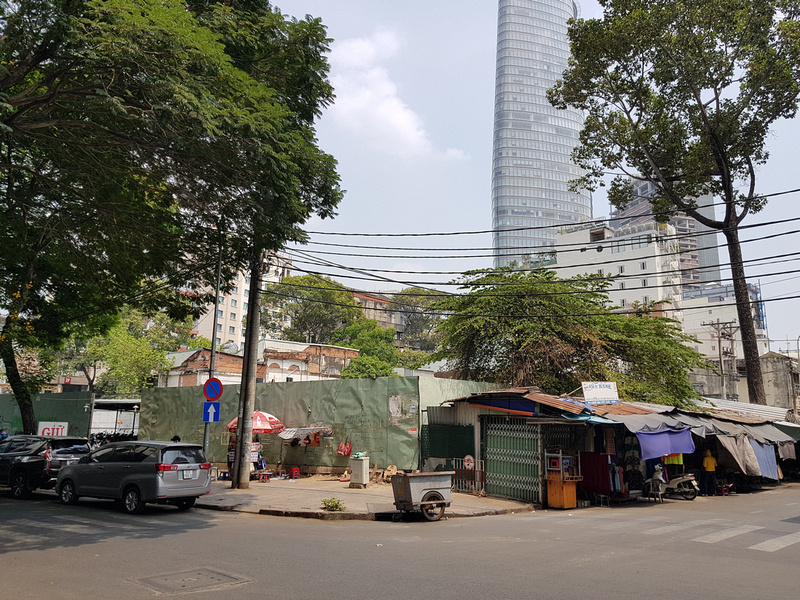 The Me Linh Tower site is on the former property of the Sabeco beverage company. 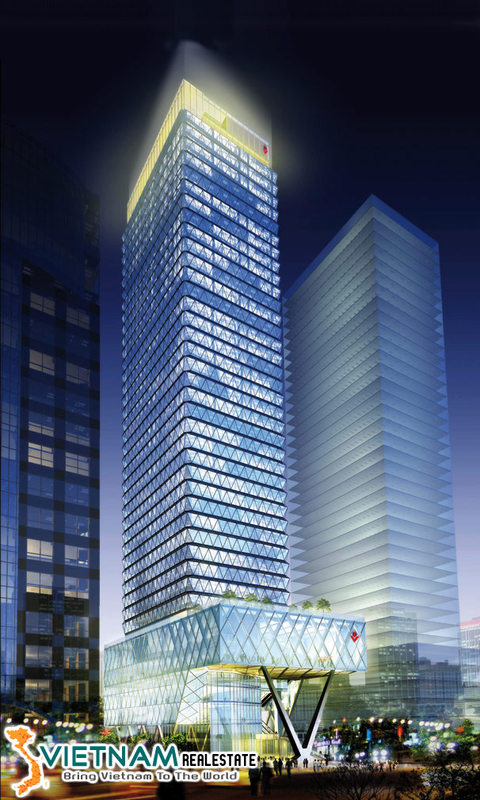 This tower was initially proposed in 2008 as the Sabeco Tower, and it has changed in design since then. The warehouses were demolished and construction briefly began in 2015. Construction was so brief that looking at the site now you wouldn’t suspect that work ever began. There is not much information about this one, which is amazing considering it’s on one of the prime streets of the city. The SkyscraperCity forum first mentions the project in August 2007, and after the land was cleared it became a bike park. Location: 15 Le Thanh Ton, District 1, HCMC. I was living next to this tower when it was being constructed, and it was moving along at a fast pace. I recall a few noisy nights when cement trucks were lined up pouring the floors overnight. The building topped out and then work stopped. 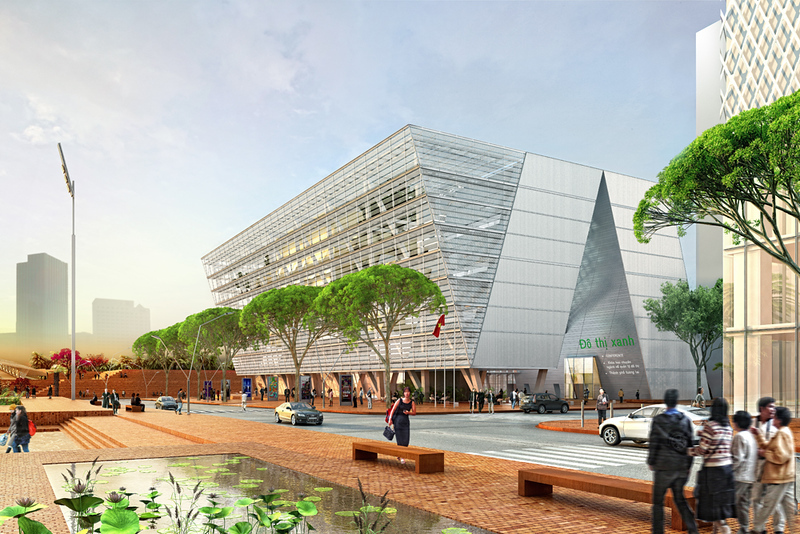 The concept image shows the entrance on the other side of Le Thanh Ton, so the future address will more likely be the Le Loi extension. If there was one building that a city would want to make sure gets finished, it’s a building dedicated to city planning. 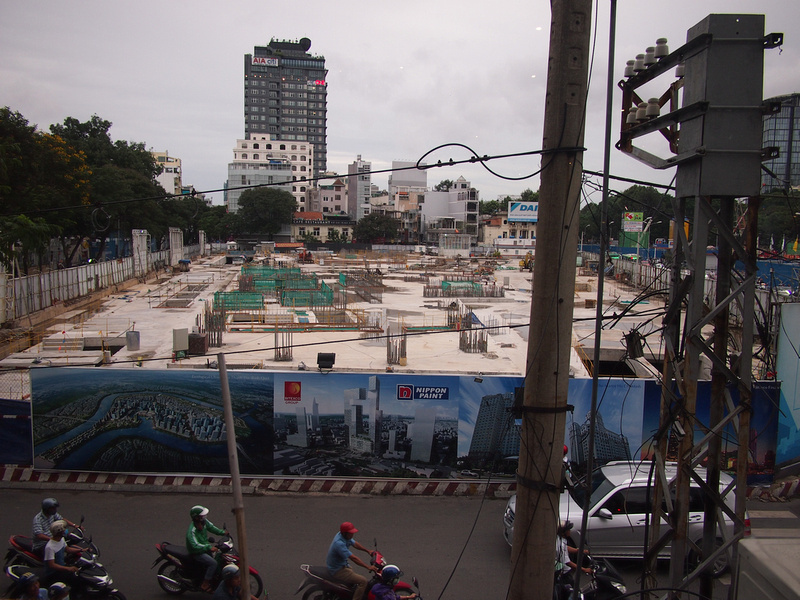 Alas, the City Planning Exhibition Center in Thu Thiem remains unfinished on the river front. To be fair, even if it was finished it wouldn’t be receiving many visitors yet as there is nothing else there. 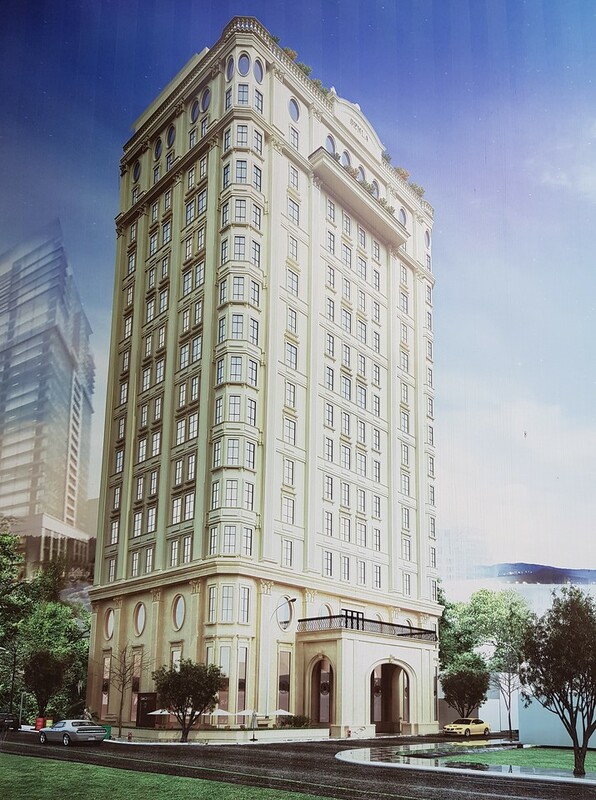 The Hotel Majestic is one of the classic heritage hotels of old Saigon. The extension will be built next to it, sort of emulating its style on the ground level, before towering above it with two modern towers. Work began on this project, but didn’t get beyond the ground level. 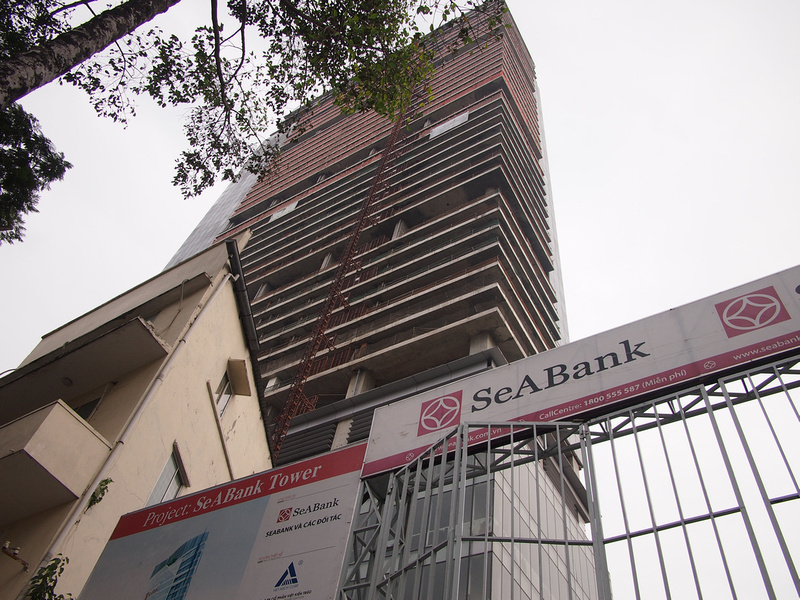 The Senla Boutique Hotel began construction in 2011 and it has remained incomplete since topping out. There was a change of ownership in 2017, so maybe 2018 will be the year it starts again. 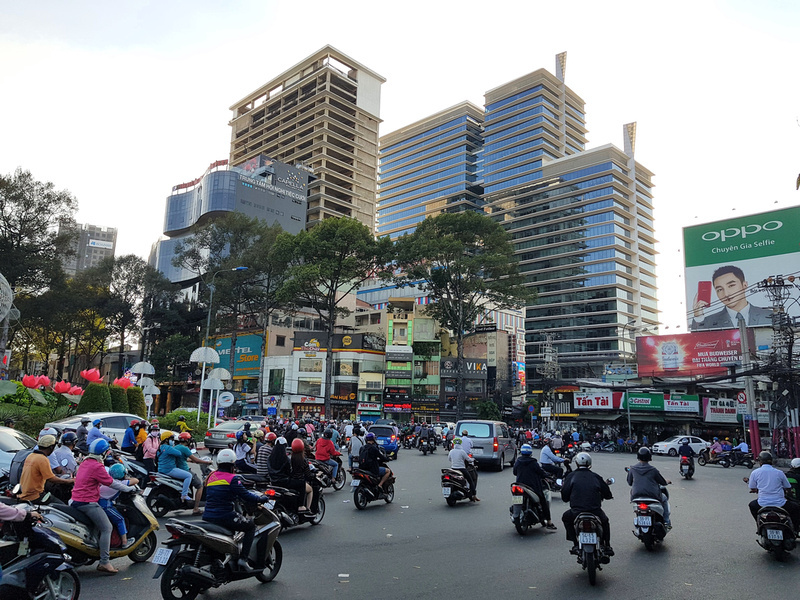 Location: Vo Van Tan/Nam Ky Khoi Nghia/Nguyen Dinh Chieu/Pasteur, District 3, HCMC. 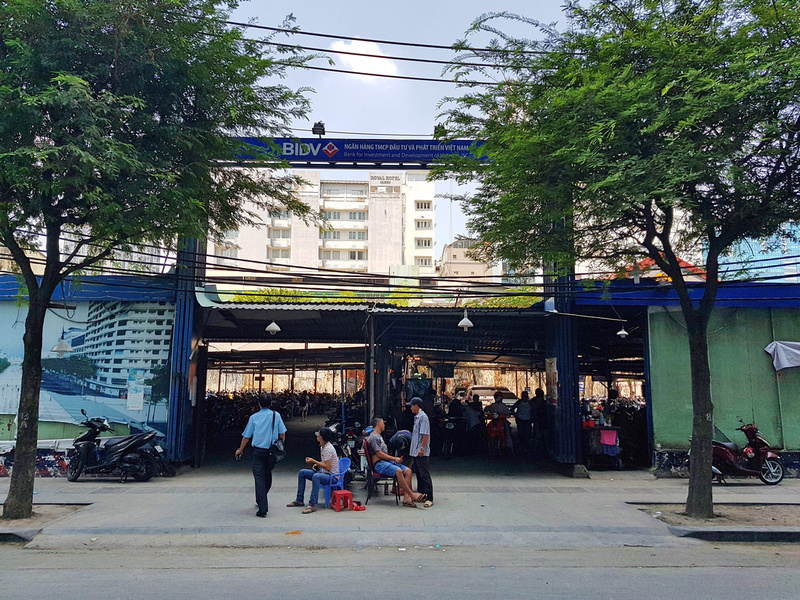 The Phan Dinh Phung Stadium will replace the sports centre that occupied this prominent D3 location. The previous facilities were already showing its age, even before part of the roof collapsed in 2014. The land has now been cleared but no work has started yet. Since the original announcement of the upgrade there was an update to the original design. Location: 285 CMT 8, District 10, HCMC. 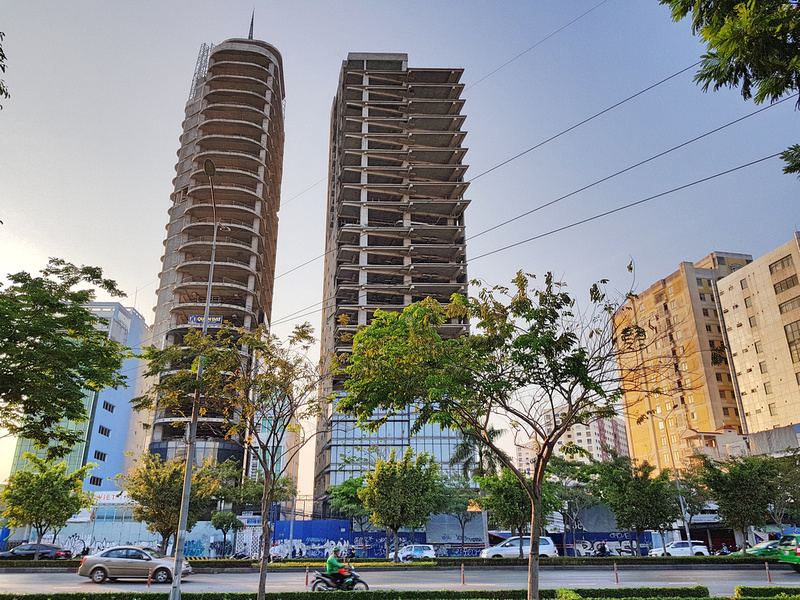 The Viettel Trade Center got off to a good start with the concrete shell of both towers boing finished. Then worked stopped, then restarted on one of the towers. 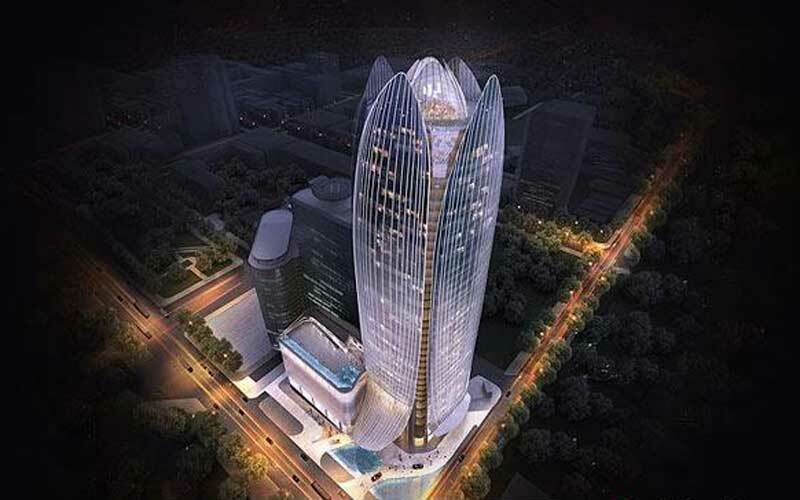 The first tower is completed, while the second towers remains to be finished. 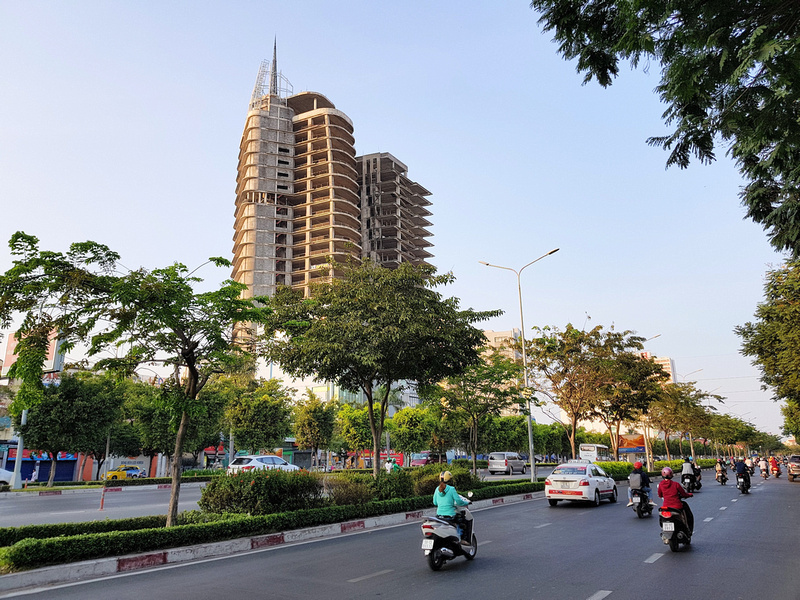 Location: 131 Dien Bien Phu, Binh Thanh, HCMC. 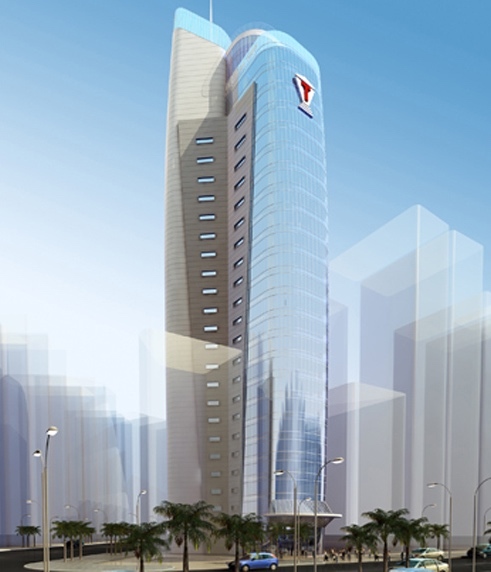 The V Tower (or V-Ikon) got as far as completing the concrete shell, and then there was a shortage of funding which has since halted the construction. 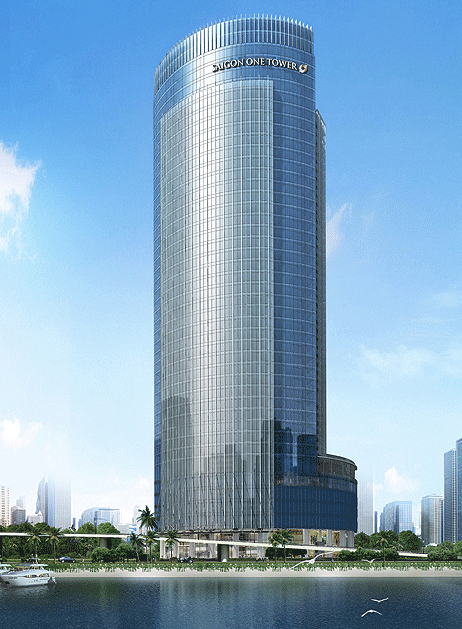 Location: 141-143-145 Dien Bien Phu, Binh Thanh, HCMC. Next to the V Tower is the DB Tower, which also got to within being finished before being abandoned. This abandoned lot at the corner of Nguyen Sieu and Thi Sach near the Japantown area got as far as having a basement constructed. It is now a bike park and is slowly being reclaimed by nature. I’ve put this here hoping someone knows more details about it. Address: Corner Huynh Thuc Khang and Ton That Dam, District 1, HCMC. This prime of prime inner city land is a mystery to me, so I’m leaving it here incase someone knows something about it. 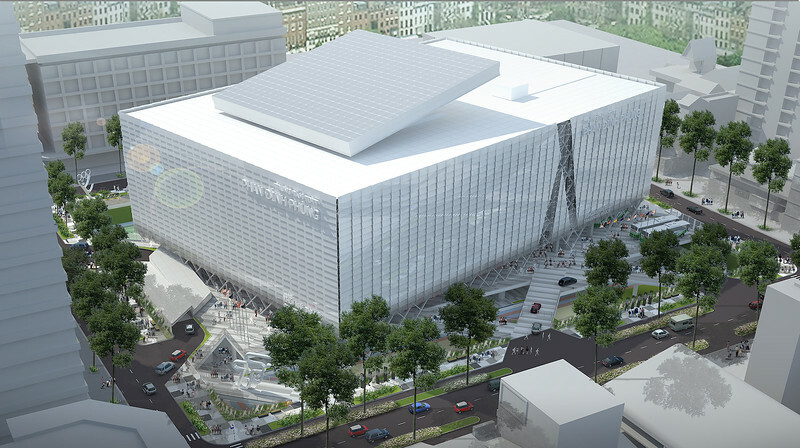 Springlight City was announced in 2011, and the massive block of prime real estate it will be built on was razed in preparation. There are some cranes and construction material onsite, but it has been dormant for years now.